Hi everyone, welcome back to another episode of the Art of Business English. Recently, one of my students was promoted to a new position. He will be required to show guests around the factory and explain the different areas and processes. So, I decided to put together this episode for him and for those of you who may have to do the same thing. 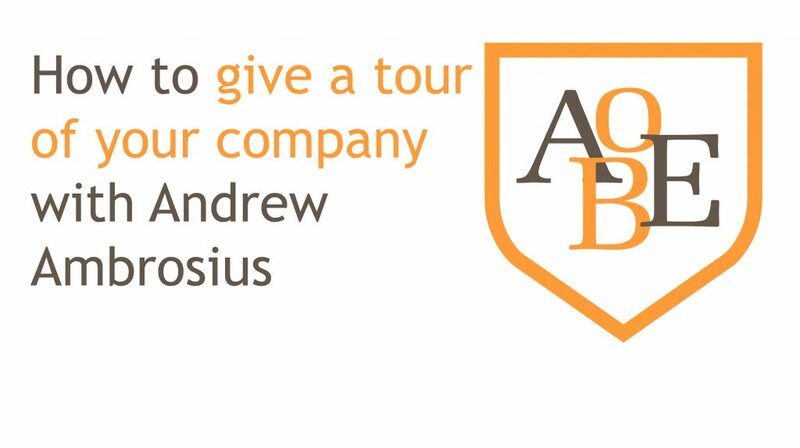 Today, we will be covering how to give a guided tour and how to show people around your company. Remember, if you have an area of business that you would like help with, then don’t hesitate to contact me, I would love to help you out and prepare an episode just for you. Many other people will also benefit from this so keep it in mind. So, let’s take a look at what we are going to cover in today’s episode. So, let’s not waste any time and get straight into it. The key to a successful tour is planning. You need to have an idea of what you are going to explain and the route that you are going to follow before your guests arrive. Objective: if possible you should know your visitors´ objectives. This will help you to adapt the tour and show them the parts of the factory that interest them most. Ask for an anticipate questions: you should be ready for any questions that come your way. Furthermore, you should ask regularly if there are any questions you can answer. Make sure staff know: having your staff know a tour will take place will help them feel more comfortable if they are asked any questions. Include staff members in your tour where possible. Duration of tour: Think about how long the tour will take and make sure you have enough time and things to say. Check with your guest how much time they have before the tour and if necessary adjust the tour length to fit this. The route: Think about which route you should take around the factory or offices. Keep in mind factors such as noise and any dangers. English expressions: Prepare what you are going to say and then print some expressions out or have them on a tablet ready to consult during the tour. Remember the general rule, large groups, more formal language, small groups of 3 or 4, less formal. Machinery and noise: This can be a big issue for effective communication. You will need to use effective body-language and signalling with your hands. Try and avoid turning away from people when you are talking to them. It is best to explain a noisy machine before you reach it, so you don’t need to shout. Before we end this first part of the episode, I would like to give you an example of how to brainstorm some typical questions. Simply sit down with some colleagues and generate some ideas based on what you think people will want to know. Remember, this will be linked to the individual objective for each visit. Here are some example questions to get you started. How many people for this process? How many people do you need to handle the material? What is the workability of this part/process? Can you explain the ease of production? How are you implementing MTCR in the process? OK, now that we have a plan in place, let’s take a look at some expressions you can use to start the tour. Starting a tour is similar in some ways to starting a presentation, we need to welcome the guests and give them some indication of what we will be doing. Let’s take a look at some useful expressions. If I could all just have your attention for a minute/May I have your attention, please. Welcome to The Ford Motor Company/ I would like to welcome you all to the Ford Motor Company. My name is Andrew Ambrosius and today I will be your guide around the installations / offices / plant / factory/ As some of you may know, my name is Andrew and today I will be leading this tour of the installations / offices / plant / factory. The tour should take about 30 minutes, please feel free to ask me any questions as we make our way around/The tour should last about 45 minutes. Don’t hesitate to ask me any questions at any time. / I expect the tour to last 30 minutes, is that OK for everyone? Depending on the type of tour, you can offer some warnings about noise and dangers. For example, you could use some of the following expressions. All guests must put on their ear muffs when I indicate. I will hold mine up in the air before we enter a noisy area. Before we enter the plant, please place your protective glasses firmly on your face. Can I please bring to your attention some safety points? / I would like to explain the safety rules before we officially start the tour. / Could all guests listen carefully while I explain the safety precautions. OK, now that we have welcomed the guests and explained any safety precautions, let’s look at some essential language for during the tour. What to say during the tour. I would like to start this section by looking at some common expressions we can use for giving indications. I’ll give you the expression then the translation. Please come this way. Por favor, vengan por aquí. If everyone could follow me/ If you could all follow me /If you would follow me Si todos pudieran seguirme. Now that we have some common expressions for giving indications, I would like to quickly give you a list of common prepositions. Here are a few phrases to help you with some small talk before the start of the tour. These will help in situations where you are waiting for someone to arrive and you find yourself alone with the guests. Is this your first time in Barcelona? Can I recommend any things to do in Barcelona? So, how is business in your parts? Will you be staying long in Barcelona? Is there any particular part of the plant that interests you the most? Let’s look at some common expressions for talking about your company. During the tour you may want to explain the company history or some milestones. To be founded The company was founded in 1956. Set up The company was set up by two brothers. To be started The company was started by Sir Adam Barker. In the past In the past the company worked mainly in the textile industry. In the early days In the early days the company struggled. Since its inception Since its inception the company has focused on manufacturing for the automobile industry. To have a breakthrough The company made a breakthrough in early 2000 with the release of its now famous product X. To take on investors The company took on investors in the mid 90´s. To be taken over The company was taken over in late 2005. Once you have finished giving some history and milestones, you may want to talk about the building premises, plant or offices. To be XXX2m Our factory is 10,000 square metres. Gateway to This is the gateway to the main pressing area. Close to Our warehouse is very close to the production centre. To be refurbished This section of the plant/office was refurbished recently. Floor As you can see we have quite a nice view from the 15th floor. Window pane We have wall to ceiling window panes in each office. Finally, let’s look at some expressions for talking specifically about a plant or factory space. Main line Here is the main line for parts assembly. Warehouse Our warehouse is state of the art with a modern parts tracking system. Lorries We have capacity for 12 loading bays for medium to large sized lorries. Nearside plant The nearside plant is closest to the East perimeter. Offload Our supplies need to offload all material within 1 hour. Areas/Zones This is a safety zone around this machine. Assembly area This is the main assembly area where we have over 55 workers per shift. To finish up today, I am just going to give you some tips on how you can bring a tour to a nice close. Remember, this language depends on the formality of the tour. Let’s take a look at some nice expressions for wrapping things up. Would anyone like to ask any final questions. Well that brings us to the end of the tour. Are there any last questions? It has been my pleasure to have you here today at the company. I would like to thank you for coming. On behalf of Maverick Group I would like to personally thank you for joining us today. I hope you have found the tour interesting, if you have any further questions in the future, then don't hesitate to email or call me. I hope you enjoyed the tour, will you be leaving now, or could I take you somewhere? I hope you enjoy the rest of your time in Barcelona. Thank you for joining me on this tour, now, if there are no further questions, I will take you to the meeting room where some coffee and cake is waiting. Will you be staying on to work for a bit? Well, there we are, the end of another episode. I would like to finish up by giving you some final tips. The key to your tour is planning, all tours are different but with these expressions you have the framework to help you to put together your tour. You have nice expressions for the introduction and conclusion and the body of your tour can be filled in with relevant information and some key language from this episode. As always, I really hope you have found this episode both interesting and useful. If you do need any further advice, then please get in touch and I will be more than happy to help. Remember, we don’t promote the AOBE podcast, so we can only help others and reach more people by having you share and recommend it to your friends and family. If you love AOBE, then please share and rate us. I would really appreciate that. Well, till next week see you all soon.